National Challenge Starts in January 2019, register now! In a 'company to the Moon' challenge, the whole organisation works together to walk 384,400 km. We will calculate a time limit that is challenging, so participants are encouraged to take some extra steps. Participants can follow the status 24/7 on the app. For smaller companies we can do variations like 'Around the World' (40.075 km). In a Team Battle, the workplace is split up in several teams that compete against each other. Team are rewarded with points for steps, exercises and meditations. This way every employee can contribute to the team points in their own way. Participants see their and other team's progress on the leader board. The point system and length of challenges can be adjusted. In individual challenges, employees can challenge each other. In a 7 days 10k streak, participants have to complete 10,000 steps during 7 days. Participants that don't make the 10,000 steps are eliminated. Individual challenges can be organised and customised without the help of the Zevo Health team. 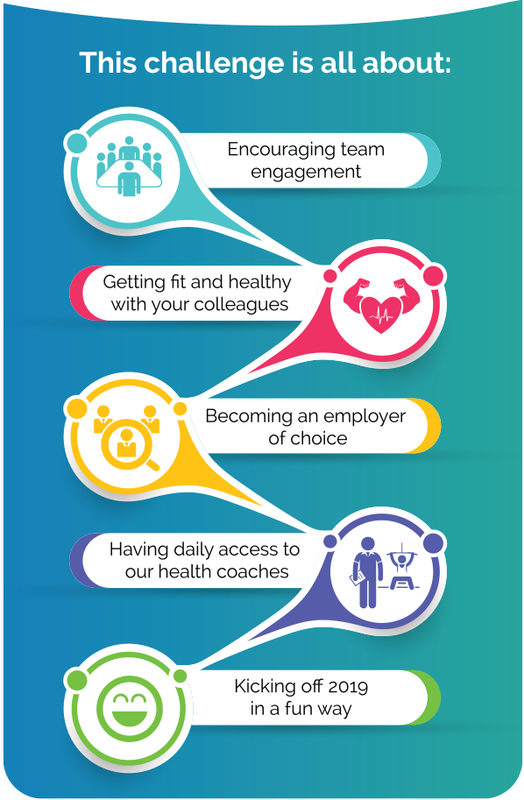 Zevo Health are delighted to launch the Zevo Health Workplace Challenge 2019. This is a 4 week challenge starting on the 21st of January 2019. We facilitate the All – Ireland challenge through our technology while also getting a visit by our health coaches during on-boarding phase. Our programme is based on our three core areas – Move (Exercise), Nourish (Nutrition) and Inspire (Mental Well being). Each member will gain rewards for completing activities to enable your workplace to become the All Ireland Zevo Health winner 2019!